Last week, President Xi Jinping attended the World Economic Forum in Davos, Switzerland. Businesses, world leaders, NGOs, and think tanks used the forum to forecast concerns, offer international solutions, and point out emerging global trends. China was often a point of discussion. 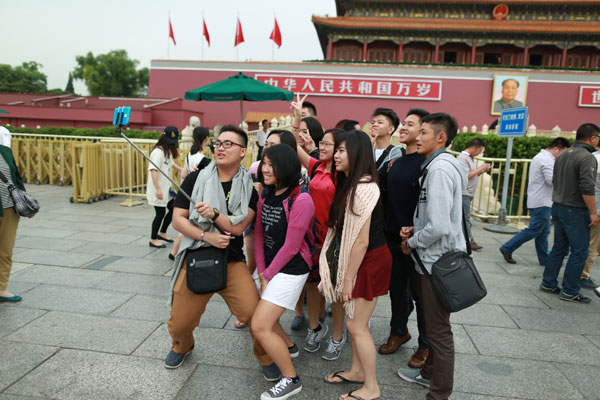 Ipsos, for instance, presented new China-related findings from its 2016 study, “What Worries the World.” The global market research firm surveyed over 18,000 adults aged 18 to 64 and asked them about top trends they find most concerning in their own country. Options ranged from terrorism, to unemployment, to political corruption. Of all countries surveyed, China was a standout. 38% of Chinese respondents thought “threats against the environment” were most concerning — 25% higher than any other surveyed country. Likewise, China ranked in the top two for “maintaining social programs.” 27% of respondents worried about their social safety net, with a focus on medical insurance and pensions. 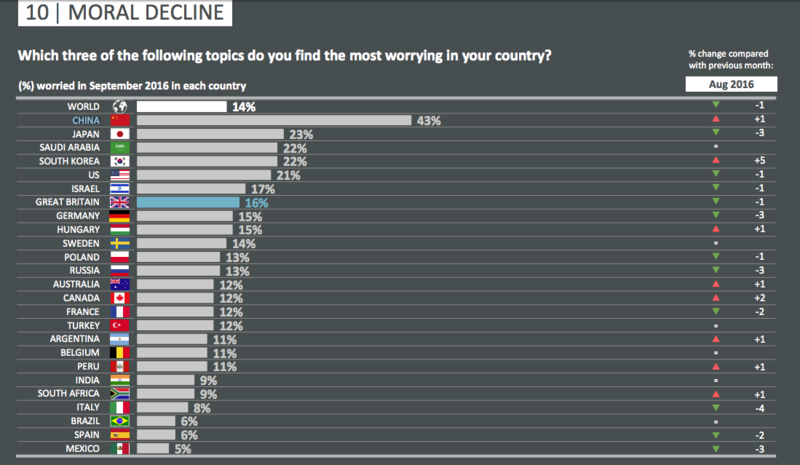 43% listed this as their primary concern, 20% higher than the second- and third-ranked countries in this category. Why are Chinese people concerned about these issues? What exactly is “declining morality”? How can companies address these concerns and view them as opportunities? As mentioned above, 38% of surveyed Chinese adults thought the environment was their greatest concern. This is not surprising. Given two recent red alerts, carbon emissions targets, and the closure of 104 planned coal-fired plants, Chinese news revolves around pollution. China is the world’s largest contributor of carbon emissions, and in the past, has funded state-owned enterprises (SOEs) in coal and heavy industry. This past year, however, the government became more responsive to pollution. Beijing created an Environmental Police Force, and the National Development and Reform Commission announced an ambitious Five-Year Plan. The plan announces targets for PM2.5, limits on coal mining, and commitments to alternative energy. In spite of this progress, Chinese people are still 25% more concerned about the environment than any other country’s respondents. They also show little change year over year. China was also the top-ranked country in 2015, only 1% more concerned than in 2016. Why is this number still so high? If China is committed to solving its environmental problems, why do citizens appear unconvinced? There could be a number of explanations. First, the Chinese government has shielded polluting SOEs in the past, backtracked on some of its coal targets as prices have increased, and seen misreported emissions data occur in certain cases. People could also be worried about China’s timeline for reform. According to the latest Five-Year Plan, Chinese cities should approach a PM2.5 level of 35 micrograms per cubic meter by 2020. But according to recent projections, cities like Beijing might need 10 years to reach this target — and another 20 years to reach WHO standards. Beijing did not even rank in the top 10 for China’s most polluted cities in 2016, so these estimates could be even longer for cities in Hebei, Henan, and Shaanxi. 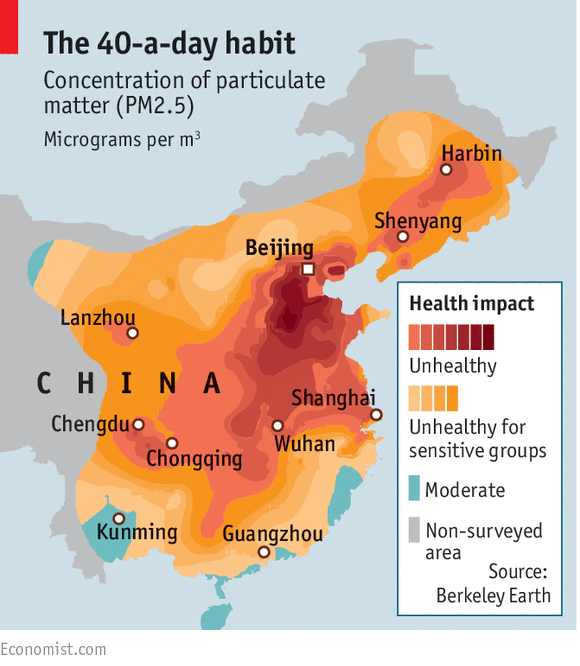 With this in mind, pollution levels will likely decrease at a slow pace — and keep Chinese citizens worried. The northeast will likely face more school closures, red alerts, and long-term health concerns for at least the next 30 years. As with environmental issues, China also ranked high for social welfare concerns. Of the 25 countries surveyed, China fell just below Japan on this issue, with 27% listing social programs as their top worry. To some, this might come as a surprise. China has historically had strong state insurance, benefits, and subsidies. Before reforming and privatizing many SOEs, the government provided most amenities in an “iron rice bowl” — a family’s work unit, coordinating their housing, long-term employment, medical insurance, food, marriage licenses, and basic education. While the government has gradually relaxed this system, a few policies remain in place. State-run health care and pension programs, in particular, are still popular among residents. So popular, in fact, that many worry about their sustainability. Funding for these insurance programs increased by 14.7%, but costs increased at a faster pace. In 2016, expenses rose 19.3%, and programs spent almost 90% of available funding. Many worry that this gap will narrow. For starters, China’s elderly are growing in number. As more people retire and cash in on pensions, the number of people collecting them could exceed the working population by 2020. The Chinese government has also recently reduced pension requirements for employers. As of 2016, they contribute roughly 1% less income than in previous years to unemployment insurance and pension plans. This could not come at a worse time, limiting funds as coverage and demand grows. Two groups that are particularly concerned? China’s elderly and retired military officers. Normally, military service comes with lifelong employment. When people retire from the military, the government helps them find a job, handles insurance, and provides a military pension. For the past 20 years, the government has fallen short on this promise. Retired military officers organize roughly three protests per year, which had record-high participation in 2016. 10,000 people protested in Beijing this past October, and another 1,000 in December. Many claims that they have not received pensions, jobs, or insurance since retiring and some have been retired for over 20 years. This is problematic, and likely to worsen, for two reasons. First, veterans of conflicts in Korea and Vietnam are now in their late 70s and 80s and need retirement money. Second, President Xi Jinping plans to cut 300,000 military jobs over the next few years. This group of retirees will soon need unemployment insurance, jobs, pensions, and benefits. 1. Family Pressure: Children born during the One-Child Policy era have to care for two parents and four grandparents. Family pressure has created a stronger need for government-run social programs. Many children cannot care for six aging relatives at once and would prefer not living with them. In one of our WeChat surveys, 47% of respondents preferred their parents to live independently — not in nursing homes or with their younger relatives. To an aging population, this seems to go against “morality,” or social expectations, that Chinese people have held for decades. Filial piety has become less feasible over time, and government programs have failed to step in where children fall short. 2. Modernity: China is developing at a rapid pace, and some worry that in the process, China also struggles to develop a cohesive national culture. 3. Corruption: Xi Jinping’s anti-corruption campaign reminds many that the Reform and Opening period brought tremendous growth, but also led to misreporting and corruption among business leaders and public officials. As China’s GDP rose in the double digits, many believe SOEs, local officials, and high-profile leaders benefited disproportionately. Since Xi Jinping came to power in 2012, his anti-corruption campaign has made people even more conscious of “immorality” at every level of public and private life. Some worry that this corruption will take years to rout out, and every week seems to expose a new scandal. This past week, for instance, Liaoning’s provincial government admitted that they had misreported economic growth for nearly 5 years. Cities and prefectural heads worried about penalties for missed targets and covered up years of negative GDP growth. Many view these concerns in a negative light, but the right business will see each shortcoming as an opportunity. Pollution, social benefits, and elderly care each offer opportunities for innovation and have already inspired international companies. Alternative energy sources: Companies could develop low-cost, high-efficiency alternatives to coal and carbon-intensive energy, and could create a new model for Chinese plants. Private nursing homes and elderly care facilities: China has few nursing homes, but a growing elderly population. Also, few doctors specialize in elderly care or geriatrics due to negative social stigmas. Private insurance apps and packages: The Chinese government has slowly opened up medical insurance to private providers, so companies could provide easy platforms to compare costs and benefits. Tags: air, China, consumers, elderly, events, Pollution, reports.